What Are the Benefits of Iodine? Who May Benefit From Iodine? Are There Any Side Effects of Iodine? How Do I Take Iodine Supplements? How Do I Pick a Good Iodine Product? In order to help you find a good product we’ve researched & compared the best iodine supplements on the market right now. J. CROW’S Lugol’s Solution of Iodine is a liquid iodine supplement that contains the strongest solution legally available. Who makes it: This product is made by J. CROW’s, a manufacturer of natural health remedies. 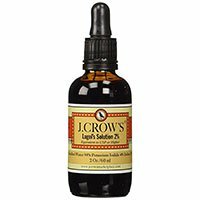 By focusing on simple, proven ingredients, mixed with the knowledge of folk medicine, J. CROW’s has created some of the most effective natural supplements out there. Today, they are the most trusted source of liquid iodine, as well as several other helpful products. 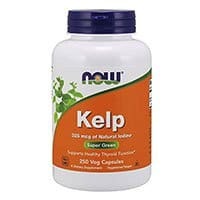 NOW Foods Kelp Caps are a great way to get a natural dose of iodine every day. Kelp is a sea vegetable, like sea weed, that naturally contains high amounts of iodine. This “green superfood”, as it’s known, is a favorite among health enthusiasts because it’s all natural and very effective. Overall, this is a good choice for those looking for a simple, natural and non-synthetic product. This supplement uses pure sea vegetables, and nothing more, so you can be sure you’re getting a pure dose of the nutrients you need. Plus, it comes from NOW Foods, which is one of the best companies in the industry. 250mg kelp containing 325mcg iodine. 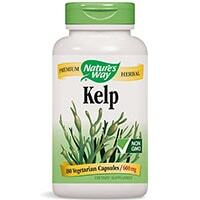 Kelp is a sea vegetable that is naturally rich in this key nutrient. A 325mcg dose of iodine represents 217% of the daily value. 150mg dulse (palmaria palmata). This nutrient-rich sea vegetable complements the natural efficacy of kelp. Who makes it: This product is made by NOW Foods, one of the largest and best supplement companies out there. Founded more than 60 years ago in 1948, NOW Foods has grown to the point where they now produce more than 1,400 different health products, including dietary supplements, health foods, sports nutrition products, and more. NOW is widely considered to be one of the most-respected names in the industry, and for good reason – they consistently produce some of the highest quality products available, at very reasonable prices! Optimox Iodoral High Potency Iodine Tablets are simple iodine supplement that comes from a great company, and offers great value for your hard-earned money. It’s a very high potency product, so keep that in mind. 5mg iodine – a high potency dose of pure iodide. 7.5mg iodide (as potassium salt) – an iodine salt. Who makes it: This product is made by Optimox Nutrition, a California-based supplement manufacturer. While not as popular as some of the household names of the supplement industry, Optimox has been growing rapidly, thanks to their high quality products and reasonable prices. Enviromedica Nascent Iodine is a supplement containing the consumable form of iodine in its atomic form rather than its molecular form. This form allows the body to fully and easily absorb the nutrient, leading to better efficacy. It’s not the cheapest option, but it still represents a great value. And although liquid drops are a bit less convenient when compared to tablets, the increased absorption rates are worth the inconvenience. 400mcg nascent iodine (per drop). Who makes it: This product is made by Enviromedica, formerly known as LL Magnetic Clay. Originally based in California, Enviromedica underwent a period of rapid growth and has now relocated to Texas. Today, they manufacture a wide range of health products, clay baths, alternative medicines and supplements. Although they have changed names, they still stick to their founding principles; quality, consistency, and better health! 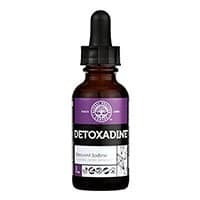 Detoxadine Advanced Iodine Supplement is a great iodine supplement that makes use of the nascent form of this key nutrient. Its use of the nascent form of this nutrient means that it absorbs quicker and more completely. With that being said, it is on the more expensive side, so keep that in mind if budget is a factor for you. 1950mcg nascent iodine (per 3 drops). 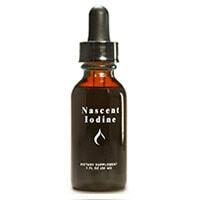 Nascent iodine is very easily absorbed, leading to a higher efficacy rate for many people. Who makes it: This product is made by Global Healing Center, or GHC for short. Founded in 1998, GHC has been committed to setting the standard for the natural health industry. Today, they’ve grown exponentially, thanks to their focus on quality products, and their products are now distributed worldwide in over 20 countries. 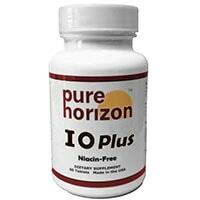 IOPlus by Pure Horizon is a quality supplement providing a good source of iodine that are niacin-free. Containing 12.5mg of iodine & iodide per capsule, these are some very potent pills. 5mg iodine and 5mg iodide (as potassium salt). This combination provides a large dose of pure iodide. Who makes it: This product is made by Pure Horizon, a USA-based supplement manufacturer. Founded in 2009, Pure Horizon has grown rapidly and is now well-known for producing a range of high grade supplements. By producing quality products and ensuring they meet strict quality standards, Pure Horizon creates good products and is a brand you can trust. Kelp is a type of sea vegetable, similar to seaweed. With 600mg of dried kelp per capsule, each serving contains 300mcg of natural iodine. For those looking for a natural and simple product, this is a good choice. 600mg kelp (a type of seaweed). 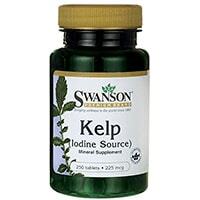 This natural kelp extract contains 300mcg iodine, so one capsule contains 200% of the Daily Value of this nutrient. Who makes it: This product is made by Nature’s Way, one of the biggest supplement companies out there. By focusing on using natural, simple ingredients to craft effective supplements, Nature’s Way has become a clear leader in the industry. And by taking steps towards sustainability, like partnering with the Non-GMO Project, Nature’s Way shows not only a commitment to helping people improve their health, but also a commitment to supporting the health of our planet. Pure Encapsulations Potassium Iodide comes packed with 225mcg of iodine (as potassium iodide) per serving, this supplement provides an easy way to fine-tune your dosage to get exactly the amount you need. It comes from a high quality company, and is overall a very good product. 225mcg iodine (as potassium iodide). This simple form of iodine helps supply your body with this nutrient, without any fillers or additives. Who makes it: This product is made by Pure Encapsulations, a company that focuses on creating simple, pure supplements to meet the needs of the community. Based in Massachusetts, Pure Encapsulations now operates worldwide, and focuses on simple, clean formulas that deliver the greatest effects without fillers or additives. Swanson Premium Kelp is a simple and natural iodine supplement making use of kelp, a sea vegetable that is very rich in iodine. Standardized to contain 225mcg of iodine in each capsule, these are affordable, easy to take, and all-natural. Plus, they come from Swanson, a well known company in the industry. 225mcg iodine (from kelp). This supplement uses natural kelp, a type of sea vegetable, to deliver a solid dose of iodine. Who makes it: This product is made by Swanson Vitamins, a large-scale manufacturer of health products. Having been in business for more than 47 year, Swanson Health Products knows the industry in and out, and consistently creates some of the most effective – and most affordable – health products available. They also offer a 100% money-back guarantee on all their products! Biotics Research Liquid Iodine contains 75mcg per drop, it’s on the lighter side dosage wise. For many people, this can actually be a positive thing, as it makes it easier to customize your dosage to fit your exact needs. It’s also a fairly affordable option, from a good company! 75mcg iodine (per drop). This is on the lower end of the scale, which can be a pro or a con depending on how you look at it. Who makes it: This product is made by Biotics Research Corporation, a company utilizing “the best of science and nature” to create superior nutritional supplements. Today, this large scale nutrition company produces a wide range of useful supplements and health products to fit the needs of the growing health conscious community. Iodine is a chemical element that is essential for many natural processes in the body. The human body needs iodine to function properly, but cannot make it on its own – which means it must be obtained through our diets. Unfortunately, the natural sources of iodine are few and far between. There are a few iodine rich foods, with the best example being sea vegetables like kelp and a few others. Unless you eat a lot of seaweed and iodized salt, you may not get enough iodine on a regular basis. If you do not get enough iodine in your diet, you may suffer from iodine deficiency. Iodine deficiency symptoms can range from minor annoyances to major health problems. It’s important that we get enough iodine on a regular basis, which is why the US government started adding iodine to table salt back in 1924. Although table salt is iodized, much of the salt used in processed foods is not. So, while that little sprinkle of salt you throw on your eggs in the morning might help you, the massive amount of sodium found in the majority of processed foods is definitely not going to help. 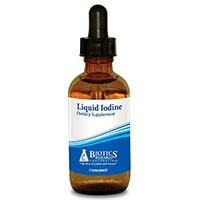 Iodine supplements are simply capsules, pills or liquid drops that help supply you with iodine. This helps ensure that you get enough on a daily basis, which can improve your health in a number of ways. Iodine tablets or capsules are the most popular, offering a concentrated dose in powdered form for easy absorption and digestion. Iodine drops, packaged in small bottles with droppers, offer higher potency, albeit at the cost of less convenience. Iodine serves a number of important roles in the human body. Millions of people worldwide suffer from iodine deficiency, and it causes serious health problems. The benefits of iodine are primarily seen in people who begin taking supplements when they are deficient in the nutrient – in other words, if you get enough iodine from your regular diet, you likely won’t see as much positive benefit from these supplements. One of iodine’s key roles in the body is supporting the thyroid. Without it, the thyroid struggles to make hormones. This can lead to the body pushing the thyroid to work harder and harder, which can lead to health problems including goiter. The thyroid also plays a key role in energy production, metabolic rate, and more. In addition to affecting how the thyroid works, iodine plays a key role in many other aspects of health. A lack of sufficient iodine in your system can cause hypothyroidism, which can lead to low energy levels, weight gain, dry skin, higher cholesterol, and a number of other serious health concerns. During pregnancy, iodine intake is especially important. Iodine deficiency is common during pregnancy, and it can cause some very serious repercussions for both you and your child. A lack of this key nutrient during pregnancy can lead to stunted growth (both mental & physical), mental deficiencies, and even quadriplegia and deafness. For those with a deficiency in the nutrient, or those going through certain stages of life, iodine supplements can be very helpful. Below you’ll find some of the key groups that can experience the most benefit from taking these products. Those with iodine deficiency – A deficiency in this key nutrient can cause serious side effects, and may affect up to 74% of adults worldwide. The effects of a deficiency can cause anything from fatigue to weight gain to heart disease and cancer. If you are deficient in iodine, or suspect you may be, these supplements can do wonders. Vegetarians, vegans, etc. – Since many of the best iodine rich foods are seafood and other meats, vegetarians and vegans are generally more prone to become deficient in this nutrient. With that being said, there are some foods, such as sea vegetables, that do contain a good amount of iodine and are vegan. Also, those on low-salt diets may experience a deficiency due to avoiding iodized salt (common table salt). Pregnant women – Women who are pregnant, or may become pregnant, are at risk for iodine deficiency. This nutrient plays a key role in the development of your child. If you are pregnant, you should definitely talk to your doctor about adding iodine tablets to your supplement regimen. Those looking to lose weight – If weight loss plans are in your future, you may benefit from taking an iodine supplement. Proper thyroid function plays a key role in metabolic rate, so if your thyroid is not functioning properly you may suffer from a slow metabolism, which makes it very difficult to burn fat. Now, iodine products are certainly no magic weight loss pill, but they may help some people with under-average metabolisms. Other groups can certainly benefit, as well. It’s worth it to talk to your doctor about iodine supplements, even if you don’t fall into one of the categories above. Many people suffer from nutrient deficiencies without even realizing it. Most of these side effects are fairly mild and many people will not experience any negative effects at all. With that being said, taking too much iodine can cause potentially serious side effects. Long-term use of these supplements has also been linked to more serious problems, so generally speaking these products are not meant for long-term use. Read more about potential problems here. As always, we recommend speaking to your doctor before beginning any new supplement. Since supplements affect different people in different ways, and there are potential reactions with other supplements and medications, it’s important to speak to a medical professional before proceeding. 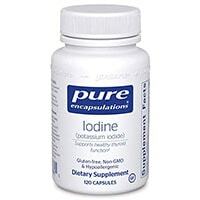 Generally speaking, taking iodine supplements is only really necessary if you have a deficiency. Many people obtain enough of this nutrient from their standard diet, especially if they eat lots of vegetables and iodized salt. As with any type of supplement or medication, it’s important to follow the proper dosing instructions. Primarily, it’s important to not take too much of a given supplement, as that can cause side effects. The amount of iodine in various supplements will vary, but will generally be somewhere in between 300mcg and 5mg. That’s quite a wide range, and the specific iodine dosage you should take depends on your needs. The World Health Organization lists the Tolerable Upper Intake level (UL) for iodine to be 1100 mcg (1.1mg) for adults. 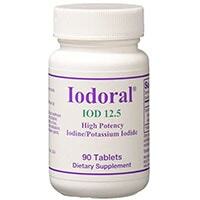 Read more about iodine dosage recommendations here. As far as when to take iodine supplements, it doesn’t make too much of a difference in terms of the time of day you choose to take it. With that being said, it’s wise to not take it on an empty stomach, as that can potentially cause some minor stomach discomfort. Other than that, just add it to your daily vitamin/supplement regimen and you’ll be good to go! If you’re taking iodine drops, it’s best to mix the concentrated drops with water. Get a small glass of water and add the appropriate number of drops (usually 1-4 depending on concentration), mix it up, and drink. It shouldn’t taste like much, but if you find the flavor unpleasant you can also mix with juice or another beverage. Some people also mix liquid iodine with lotions or other products and let it absorb through their skin. This may be an option if you don’t like the taste of iodine drops, but there hasn’t been sufficient research on this method in order to give you a definite answer on whether or not this is an effective intake method. As always, we recommend speaking to your doctor before you begin ANY supplement. A good quality iodine supplement will have a number of important characteristics. And since there are many different products out there, it’s vital to pay close attention and select the right iodine supplement for your needs and budget. Below, find some key things you should look for when making your selection. Type of supplement – is it a capsule, tablet, or iodine drops? While none of the types are clearly superior to the others, you’ll want to consider what type of supplement you’re buying. Liquid forms, while very effective, are a bit less convenient than pills. However, in several studies, liquid forms containing molecular iodine have been shown to be more effective than capsule/tablet form. Amount of Iodine – obviously the actual content of iodine in each capsule/serving size is important. Compare each ingredient label you’re considering and take note of the specific iodine dosage it offers. Depending on your needs and diet, you may need higher potency or lower potency. Cost/value – the cost of a health supplement definitely shouldn’t be the main factor in your decision, but it will likely be a factor regardless. Compare the costs of each supplement you’re considering, and be sure to use the per serving cost, rather than just comparing two different prices of two different packaged supplements. If you cannot fit iodine supplement into your budget and you may benefit from simply using a table salt which has been iodized, and this is often sufficient for the majority of people who do not suffer from hypothyroidism or a related condition.